lumen -- Where does Australias number 1 dental school go to from here? Where does Australia's number 1 dental school go to from here? Madeline Glen, Avinash Sivakumar with Professor Richard Logan The Adelaide Dental School is already the best in Australasia and ranks 39th internationally, but things are only going to get better. In July, the School moved into the University’s new $264 million Adelaide Health and Medical Sciences (AHMS) building, where it is co-located with the Adelaide Dental Hospital and the University’s Medical and Nursing schools. The Executive Dean of the Faculty of Health and Medical Sciences, Professor Alastair Burt, believes it is “perhaps the single most important development in the school’s history since it was established in 1920”. “Co-location with the Dental Hospital means our academic staff have close access to the clinics, and it provides a wealth of training opportunities for our students,” Professor Burt says. “For the first time in the University’s history, we can now have true inter-professional learning, with common skills being developed among our next generations of healthcare professionals. The 14-storey AHMS building, based in the West End biomedical precinct now known as Adelaide Biomed City, is home to state-of-the-art teaching, learning and research facilities for 1600 students and more than 600 researchers. The top three-and-a-half floors are dedicated to dentistry and oral health, with the SA Health-run Adelaide Dental Hospital occupying the top two-and-a-half floors. 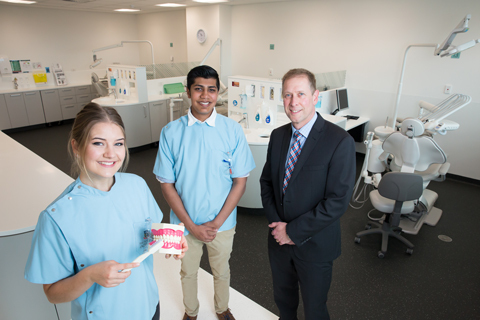 The Interim Head of the Adelaide Dental School, Professor Richard Logan, says students, staff and the community stand to benefit greatly from the new facilities. “We have a very good relationship with the South Australian Dental Service, including a 30-year partnership with SA Health to deliver clinical services 48 weeks in the year,” he says. As well as being rostered at the Adelaide Dental Hospital, students work across South Australia, helping to deliver 36,000 clinical sessions to patients each year. Second-year Bachelor of Dental Surgery student Avinash Sivakumar has wanted to study dentistry since he was a boy. “Some kids find going to the dentist a scary experience, but I always enjoyed it and was fascinated by it,” he says. “The AHMS building itself is ideal for study, and the new Dental Hospital looks fantastic. Madeline Glen, a first-year Bachelor of Oral Health student, is looking forward to starting her first practice clinics in the new Dental School. The move to the AHMS building has also provided for the co-location of an important, but until now physically separate, part of the Adelaide Dental School – the highly regarded Australian Research Centre for Population Oral Health (ARCPOH). Thanks to the ARCPOH’s work, the University has consistently secured a maximum score of 5 for dentistry in the Excellence for Research Australia process, meaning its research is considered “well above world-class”. Professor Logan says the Adelaide Dental School continues to have a strong relationship with the dental profession and its many alumni. “We’ve received a lot of support for this building, such as the generosity of Dr Joe Verco, whose great-uncle was Sir Joseph Verco, co-founder of the University’s Medical School back in 1885 and of the Dental School in 1920,” he says. “It’s important for us to acknowledge the support of the profession in working towards achieving a great outcome for the Dental School and the Dental Hospital, for our staff, students, and for the community.